Peony is a tall flower with a single light pink flower on the top of the stem. It grows widely in the West Weald. 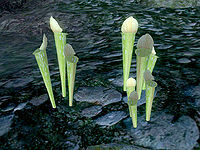 The carnivorous Pitcher Plant is a green, funnel-shaped plant found growing in the Blackwood region of Cyrodiil. 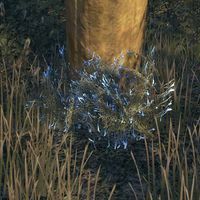 They can also grow in Vvardenfell in the Bitter Coast, Ascadian Isles, and southern Azura's Coast regions. 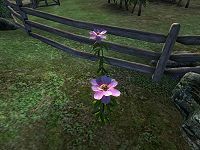 The Poison Bloom plant is a green-leafed plant with purple flowers that is found exclusively within Darkfall Passage in Skyrim. 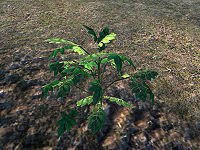 A green leafy plant, with underground tubers, that is cultivated widely on many farms for food. The Primrose has large green leaves growing in a rosette around the small pink flowers in the center. They grow in groups of two or three around the West Weald. Pumpkin Vines have large, bright green leaves. 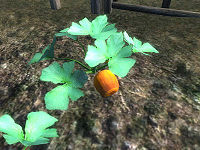 Each plant produces a single pumpkin. 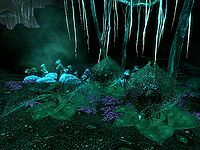 They are often associated with the Witches Festival. Carved pumpkins are sometimes known as Hollowjacks, named after Lord Hollowjack. Puspockets are a species of white mushroom. 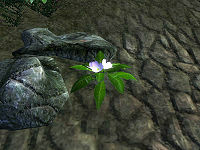 They are a common sight in Fang Lair. 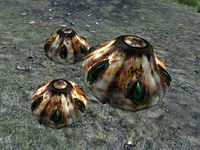 Putrid Gigantea are a brown bulbous plant found growing in the Shivering Isles. ^ Parasol Lichen item description. This page was last modified on 8 January 2019, at 22:04.